During 2015 as a final project of bachelor studies I had an opportunity to make a human-centered take on the question - How might we help people to change? This project led me through dozens of psychology papers on behavior change, shock bracelets, Baymax from Big Hero 6, chatbots, personas, bunch of concepts and high-fi prototypes. 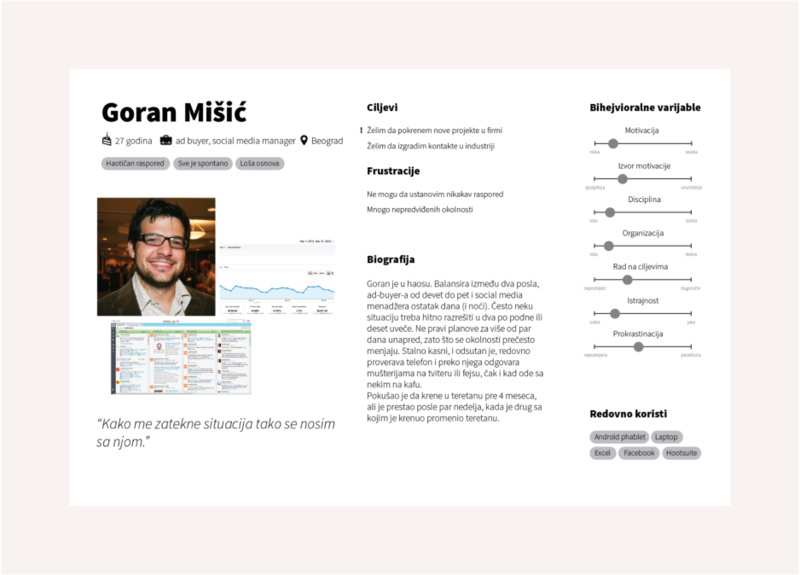 I was a one-man band responsible for user research, interaction design, prototyping and UI design. There are many myths and half-truths about habits circling around. Good example is the 21 day myth spread by innumerous blogs, gurus and coaches. One of the goals of the project was to rely on valid insights and sift through noise that was prevalent. To do this I started by reading a bunch of research papers on behavior change, habit formation, willpower, ego depletion and related subjects. Synthesis of techniques people use to change themselves and achieve their goals, problems they find along the way and motivations that drive them. After I turn the engine on I need to turn on the lights, etc. One of the most overlooked insight about behavior change is that the bigger the uncertainty is, harder it is to achieve change. 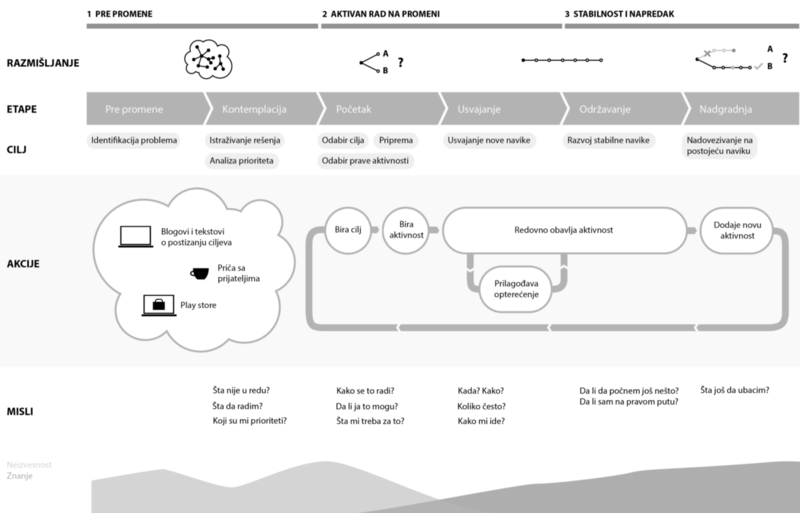 Thus, per Steve Wendelâ€™s model from Designing for Behavior Change, in order to do some action, a person needs to notice a trigger, react to it, find the activity worth doing, have everything available to do it and have enough time for it. Only if all conditions are met, person will perform the activity. Product names are omitted. 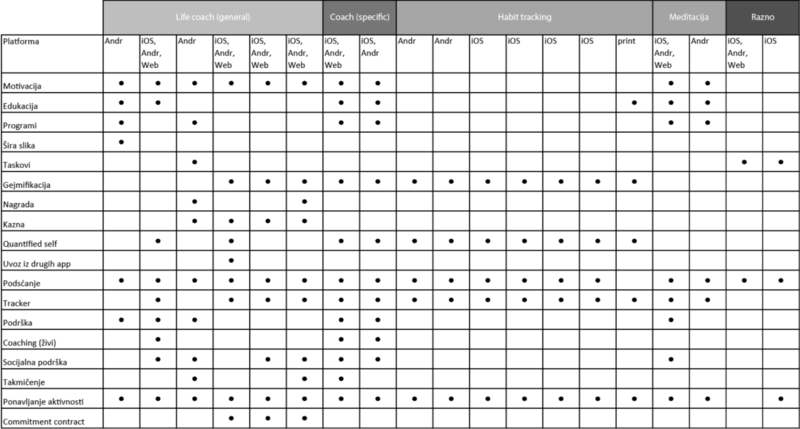 Competitor breakdown based on goals, strategies, and features they offer. This kind of comparison helps with pattern finding. 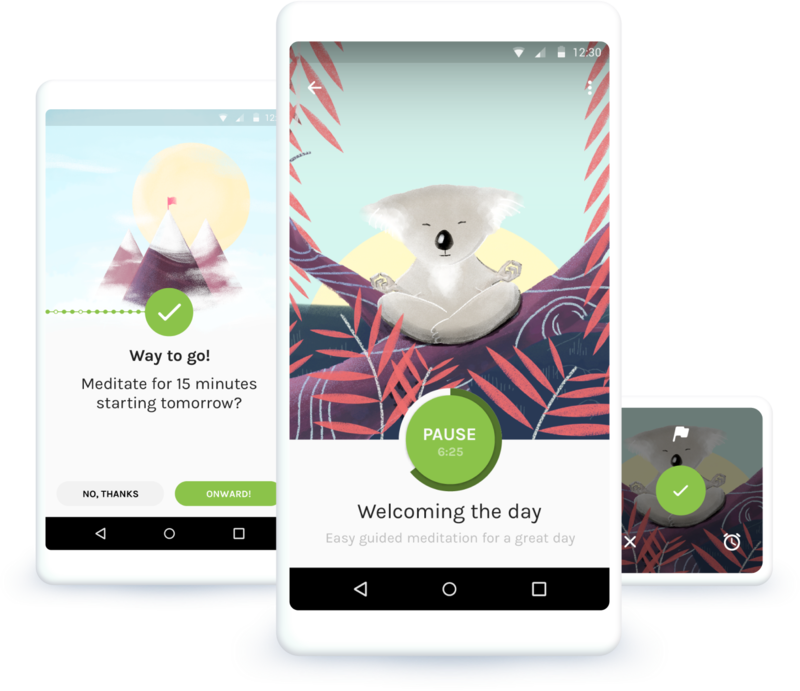 There are many products related to habit tracking, and even more focusing on specific routines, like meditation and running. They all use different strategies and cover a different ground. Some are focused on tracking, and work as repeating to-do lists using the donâ€™t-break-the-chain method, some use professional coaches and rely on social aspects, or even electroshocks. Once I had some background info, I was able to conduct open-ended interviews. This lead to formation of primary, successful, and anti persona, based on strategies and tools they used to cope with change, new habits and achieve their goals. Vanja is an english teacher with messy schedule, and for the last year some things have slipped past her. She tried running and re-learning Spanish, only to quit due to different obligations. Sheâ€™s frustrated for not achieving anything, and no obvious results. She wishes to change, but rely on enthusiasm and quit once she loses it. Also, sheâ€™s our main persona. She sees herself as a person who works out, and thatâ€™s the basis of her motivation, she wishes to be the best version of herself, and sheâ€™s actively working on it. Her boyfriend provides necessary support and they rely on each other. We want to help Vanja by providing her with a support system similar to Natashaâ€™s, and help her build the similar attitude. And thereâ€™s Goran, with his unruly two jobs, no free time routine. His plans are known only few hours in advance, and this kind of solution is a bad fit for him. Changing the behavior is a big quest for Vanja. For the start, she needs to pick a habit, adopt it and then maintain it. Once itâ€™s stable, she can build upon it and use it as a trigger for further progress. In some time she will have strong routines build of chain of simple habits - routines that are aligned with her goals. Journey map for Vanja, primary persona. It shows a way from contemplation, to beginning the journey and being guided through it. Whatâ€™s the most effective way to help Vanja change? Calendar, app, wearable, online course, personal trainer, a guide? Before deciding on the platform and format it was important to understand the story of Vanjaâ€™s day, how it unfolded, what were the obstacles, how would this â€œhelperâ€� fit her day, how it would respond to unforeseen circumstances and distractions like unexpected call from Dad, drinks with friends or such. Telling the story in this way made it clear that the solution requires to be interactive, transportable. Desktop, print and others were dismissed, mobile phone and smart watches came into the view. 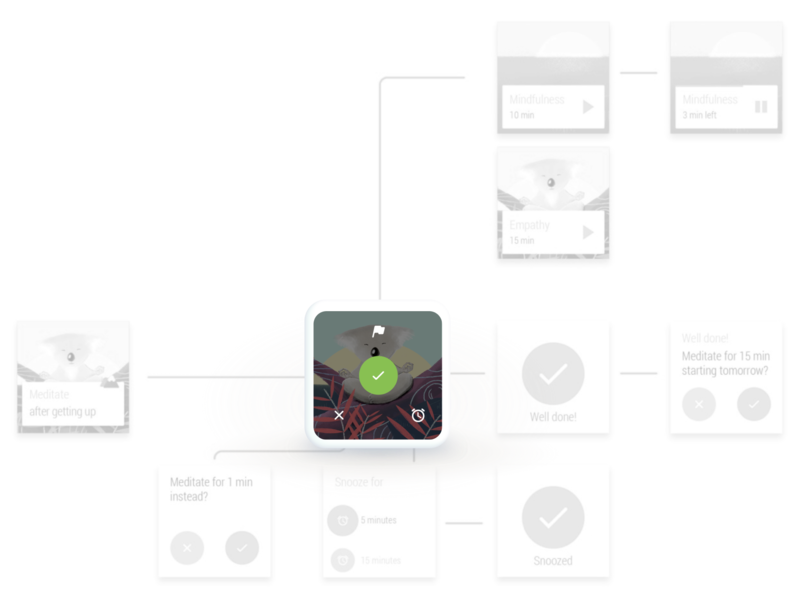 Storyboard for contextual reminder. It was important to be aware of users context, and respond to possible interruptions and unforeseen circumstances. A lo-fi Â prototype was made from sketched screens. This was a cheap and effective way to validate ideas, find problematic flows, and improve them. 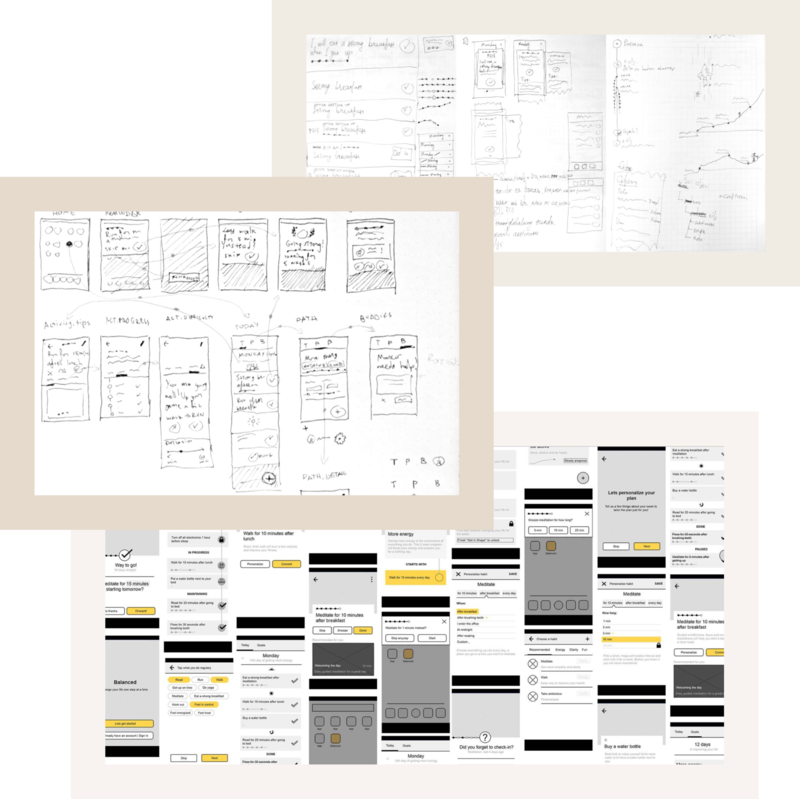 Evolution of concepts from variations on paper to lo-fi wireframes, ready for prototyping. Visuals had very important role - they needed to guide Vanja through many unknowns, help her overcome her fears, overcome barriers and be a guiding hand on the path to self-improvement. Final iteration of mascot and visuals with harmonious and mild color palette and shapes. Gradual evolution of the illustration and style. Once we had the metaphor, we needed an actor - a mascot. 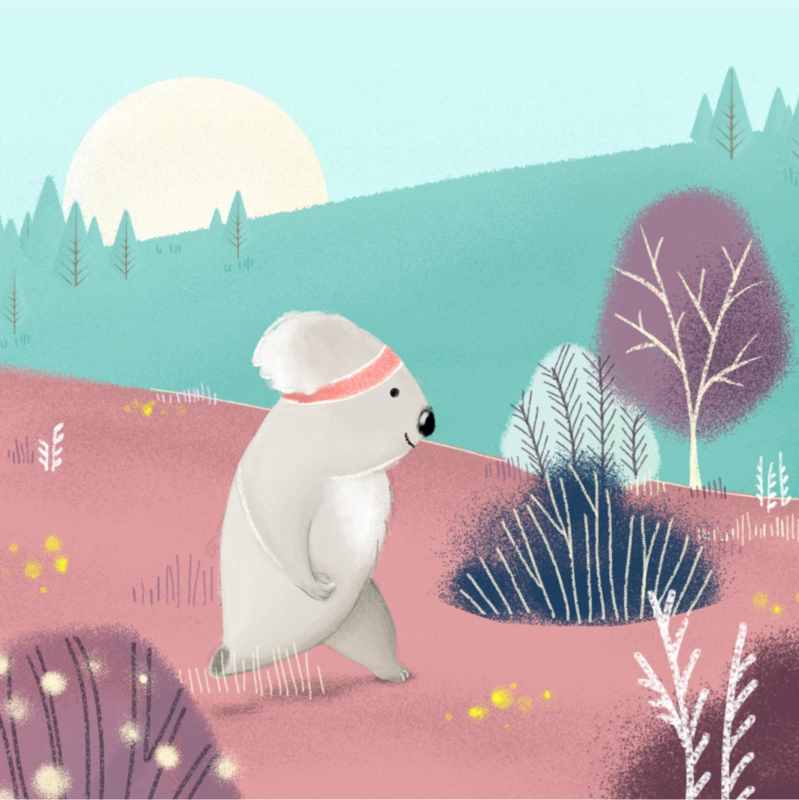 Koala bear was chosen for its natural slowness and charm. This slowness was crucial as it aligned with one of the main principles needed to successfully form a habit - constant work with sustainable effort, instead of sprinting and getting burned as a result. This went hand-in-hand with mountain climbing, and foundation of branding was formed. Once this was decided, other elements fit together - positivity, peace and accessibility, and a name to tie it all together - Achiever. Final logotype and different sketches through the process. Everyone had different goals and abilities, and they change at different speeds. This provided an interesting challenge - every activity needed to shrink and grow based on Vanjas time, abilities and needs. Achiever offers a â€œconfiguratorâ€� that helps to build a routine - to pick an intensity, trigger, and schedule. It also tries to guide Vanja by locking intensities that are considered too advanced for a current situation, and unlocks them once progress has been made. We needed to guide Vanja through the role of the application, help her set up an account, explain how will this help her, find out her preferences and aptitudes, define a goal and start with a first commitment. Step by step wizard was a natural way to achieve this without overloading her with too much questions before anything valuable was provided in return. To build a habit, opportunity, desire, and conditions need to be aligned. Reminders are the key point where all of this is integrated. The activity and duration are communicated, in a moment when the proper trigger is present, in order to increase the odds of Vanja actually doing the required thing. One of the worst kind of apps are those who donâ€™t tolerate mistakes. Achiever tried to be the opposite, by offering ways to slow down if it detected becoming a burden, offering to check-in for previous days if she forgot or didnâ€™t have time, and level-up if it became too easy and boring. 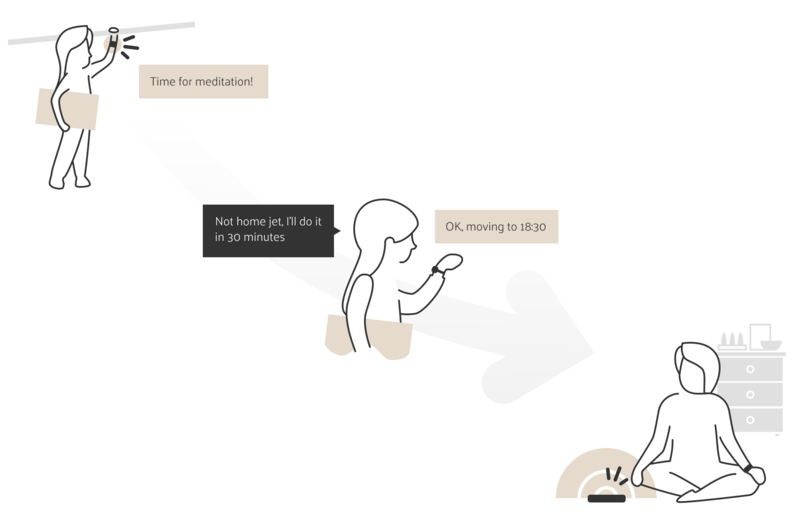 The need for contextual awareness, quick access and minimal interaction provided a good case for wearables, and a companion app for Android Wear was designed. This concept was validated with multiple prototypes that resonated well with users and in different discussion and presentations. Similar patterns and ideas started emerging in parallel, in apps for working-out, savings, investment and other. 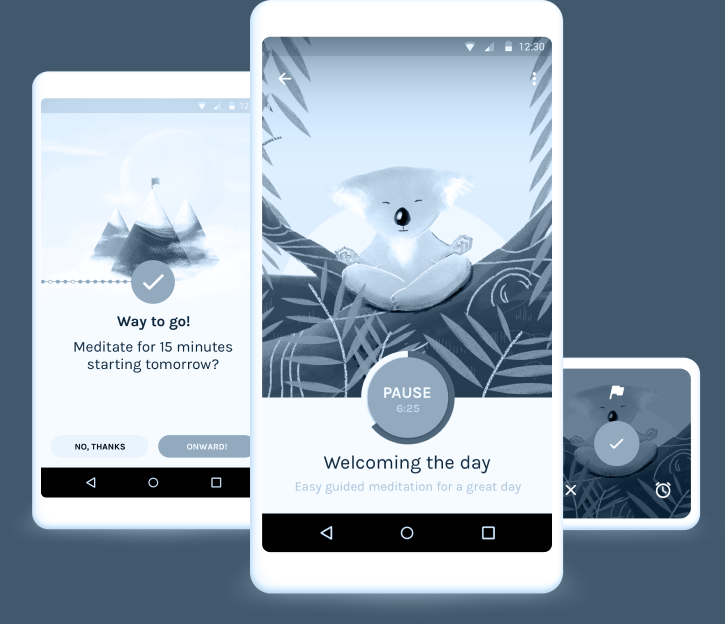 Some of them, different in execution but similar in guiding psychology and principles got large communities of users, won awards and provide a proof that thereâ€™s large untapped opportunity for this kind of apps - that use the knowledge of behaviour change not to addict and exploit users, but to help them achieve best version of themselves.